We are well-known manufacturer, supplier and exporter of high efficiency monocrystalline solar panels used for generating electricity. Monocrystalline solar panels are most efficient and widely used solar panels. They are made by single coating of silicon therefore it is referred to single crystalline cells. The main difference from other solar panels is that these are made from one large chunk of silicon crystal. They are easily identifiable by their deep black color and cut edges. Monocrystalline solar cells are also made from a very pure form of silicon, making them the most efficient material when it comes to the conversion of sunlight into energy. Additionally, if space is your factor then mono solar panels would be a good choice for you as they are most space-efficient form of silicon solar cell. They take up the least space among any solar technology running in the market. Since these solar panels yield the highest power outputs, they also require the least amount of space compared to any other types. Monocrystalline solar panels produce up to four times the amount of electricity as thin-film solar panels. 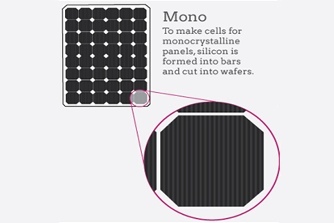 The performances of mono-crystalline panels are best during high and low light conditions. They perform better in low levels of sunlight, making them ideal for cloudy areas. They are 11-22% efficient in harvesting power. They also have the great advantage of being the longest lasting solar cell technology, with their life expectancy currently set at around half a century. And we Grace renewable Energy provide 25 years of warranty. These panels perform better in low-light conditions than their poly-counterparts. Monocrystalline solar panels are the original solar panels and have been for quite a while giving proof of their strength and longetivity. The new technology innovation, establishment, execution issues are altogether caught on. A few of solar panels installed by us in 90’s are as yet giving power today. Single crystal stone boards have even withstood the rigors of space travel! Some other solar websites suggest that single crystalline solar panels manufacturer can last up to 50 years. No doubt it is true but there will be a slight drop off in efficiency of around 0.5% on average per year. Most performance warranties go for 25 years, but as long as the Solar PV panel is kept clean it will continue to produce electricity. As mentioned above Solar PV panels manufacturer from Monocrystalline solar cells can change over the most noteworthy measure of solar energy into power of a level of flat solar panel. If your aim is to produce the most power from a particular range for instance rooftop this kind of solar panel unquestionably be considered. Consequently, Monocrystalline solar panels are best for urban area cities as there space is restricted. The cost of solar panels is typically around 60% of the cost of a fully installed solar power system, with installation being a significant cost component. We can expect that many new technologies will be introduced in the coming years that will increase the demand for electricity, which will push up demand, and make it ever more desirable to be able to produce your own electricity, so why should we not plan ahead and produce as much as you can from the space you allocate for this purpose. If you use thin film panels than more panels are needed and somewhat nullify this aspects, especially given the extra mounting rails sometimes needed as thin film offer a lower level of embedded energy per panel. Embodied energy remit to the amount of energy that is required manufacture and supply a product. Monocrystalline solar modules suffer a reduction in output once the temperature from the sunlight reaches around fifty degrees Celsius/a hundred and fifteen degrees Fahrenheit. Decreases of in between of twelve and fifteen percent can be normal. This loss of proficiency is lower than what is normally experienced by proprietors of solar PV boards produced using polycrystalline cells.